Most of you know that I mainly use samples and miniatures when preparing my Reviews. I usually buy these in Holland and sometimes in Germany or the UK. Sometimes I receive samples from friends or readers or independent bottlers. In only two cases I received a few samples directly from distilleries. 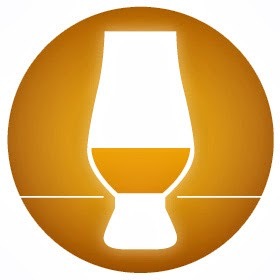 When planning my reviews I always try to give attention to all Scottish Whisky regions as well as most of the other Whisky/Whiskey/Bourbon producing regions all over the world with special attention to the USA, Ireland and Japan. And last but not least the blends. At the request of many readers I give preference to more recent expressions. As a result my backlog of older samples has increased quite a bit. To do justice to those samples I will review them in the format of Specials. These specials will review specific distilleries or take a look at specific bottlers, countries, regions or Blends. The reviews in these Specials will concentrate more on the Whisky and won't go into details about distilleries, maturation etc. I do hope you will like these Specials just as much as my regular reviews and I look forward to your reactions and suggestions. 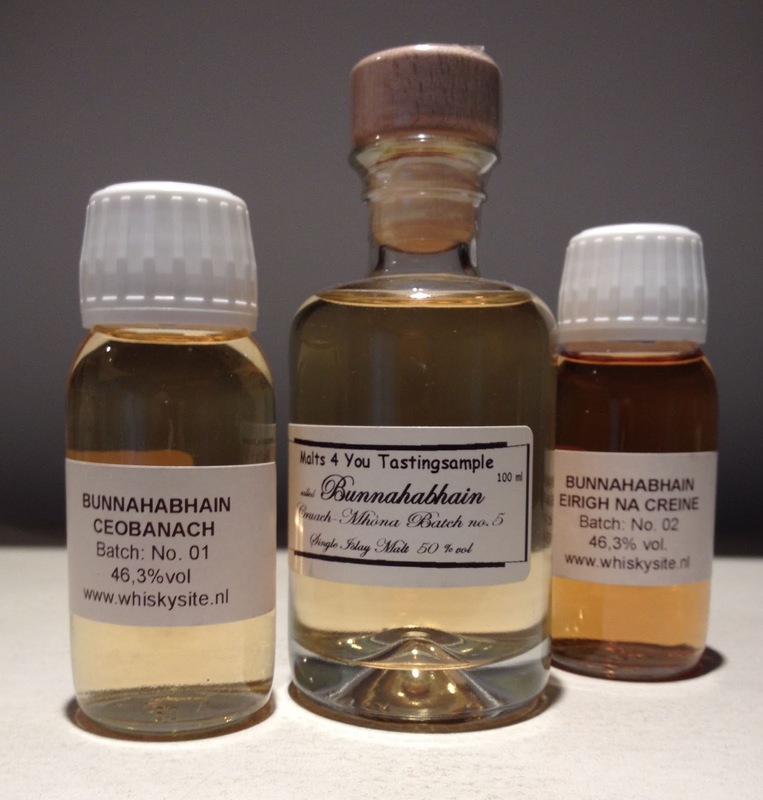 In today's Distillery-Special I will review three Bunnahabhain expressions. Enjoy! Price Range: US$ 60-80 (April 2018). Buying Advice: 😒 Uninteresting and Thin. Too expensive for what it offers. A little Thin and obviously relatively Young. Although Peat and Smoke are not exceptionally strong they are the main drivers on the Nose. Peat (Dirty Earth), Cold Smoke, Peabees, Salted Caramel, Vanilla, Grass/Straw, Lemon Peel and White Chocolate. Peabees (Peated Biscuits) is a word I invented when reviewing the Toiteach. Heather-Honey, Brine, Tar, Fresh Newspaper, Mint, Leather, Nuts and Nutshells, Apple, Nectarine, Bounty Bars and a few Mineral notes. A little Thin despite the seemingly adequate ABV. Relatively Young, Medium-Dry, Sweet and a little Salty. A light Bitterness as well. Peat (Dirty Earth), Cold Smoke, Toasted Cereals, Salted Caramel, Brine, Tar, Oak Char, Ashes, Nutshells, Orange, Grapefruit, Apple, Pear and Pepper. Butterscotch, Lemon, Iodine, Cinnamon, Nutmeg, Licorice, Lemon-Grass, Mint, Leather and Freshly grated Ginger. Not very Long, Medium Dry, a little Hot, slightly Meaty and Bitter-Sweet. I find Toasted Cereals, Peat (Dirty Earth), Cold Smoke, Straw, Salted Caramel, Ashes, Tar, Leather, Lemon, Orange, Grapefruit, Smoked Mackerel, Oak Char, Licorice, Apple, Sugar, Rubber Tyres, Pepper, Nutmeg and Mint. No need to add Water to this Bunnahabhain. It's Thin enough as it is. Okay. No more than that. Nothing to get excited about. 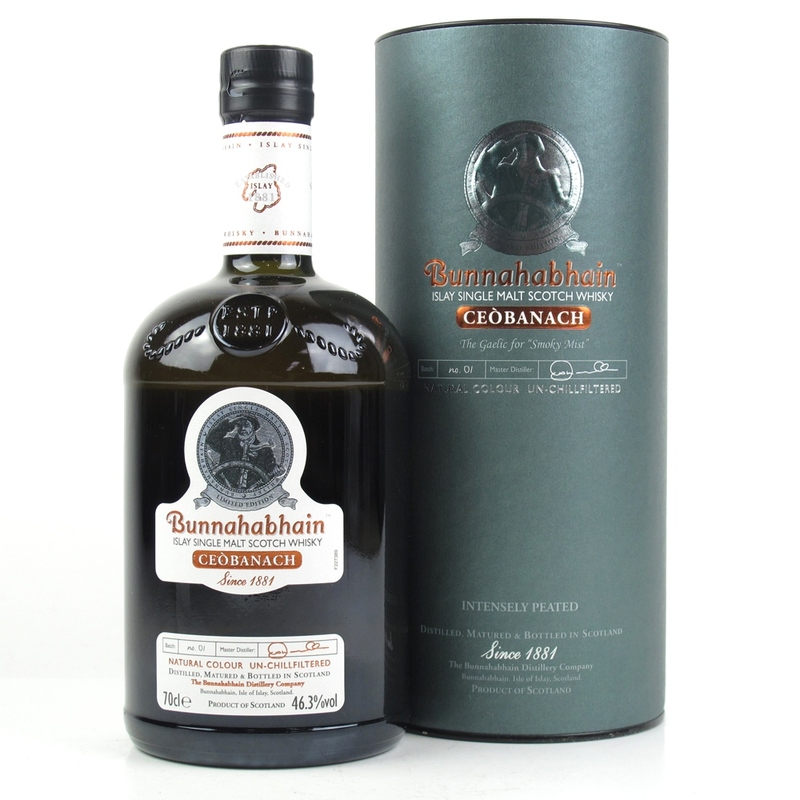 The peated Ceobanach was launched in 2014 and is part of Bunnahabhain's core range. 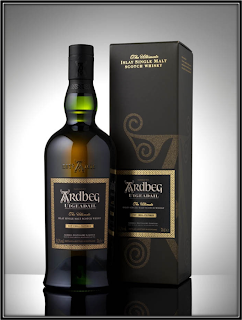 Although it's a NAS expression it is generally assumed that the Spirit for this Malt matured for at least 10 Years. It is pronounced as Kyaw-Bin-Och which means "Smoky Mist". 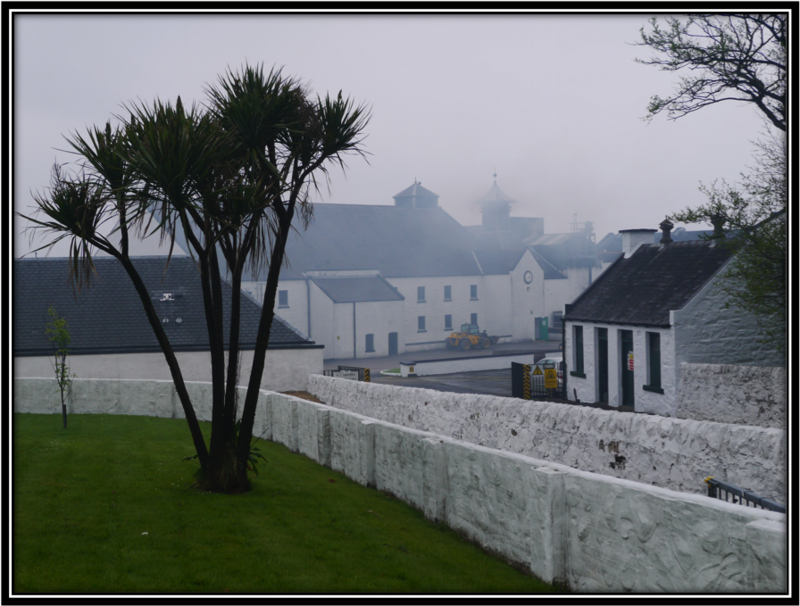 It honours the times that the people on Islay used Peat for many things, including producing Bunnahabhain Whisky. I'm not impressed by the Ceobanach. It's a young and thin peated Whiskey that misses the strength of say young Ardbeg or young Laphroaig. It's almost like a diet version of young Ardbeg. 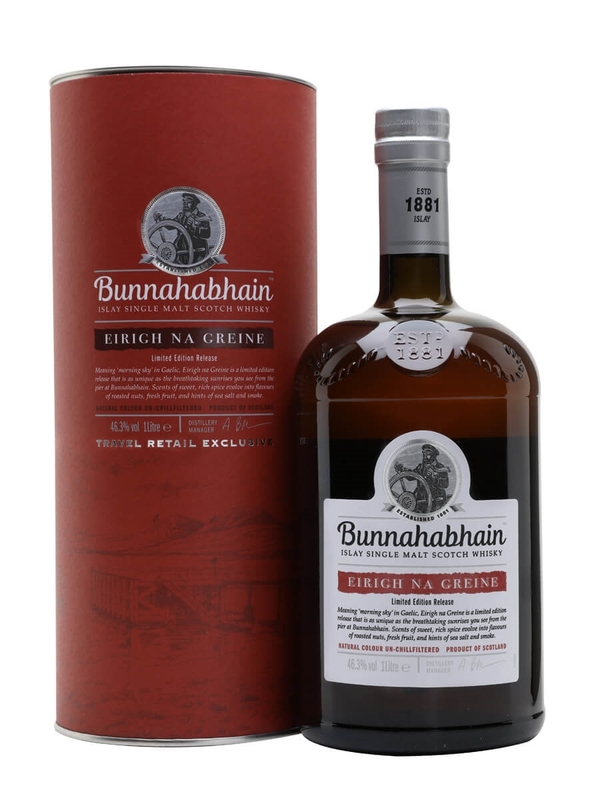 Within the Bunnahabhain portfolio it is somewhat comparable to the Toiteach. I must say I like the latter a lot better. The Sherry cask Finish gives it more depth and it doesn't feel so Thin. Maturation: A mix of (mainly) Refill Bourbon casks and some Sherry casks. Price Range: Around US$ 70 (April 2018). Again, a little Thin and Underwhelming. There's a Youngish feel to it, almost like a Gin or Rum or some other white Spirit. Despite the high ABV, the Alcohol is not overpowering. Like with the Ceobanach, the Smoke and Peat are not really strong. Nevertheless they are the main drivers on the Nose. Cold Smoke, Muddy Earth, Toasted Barley, Burnt Toast, Salted Toffee, Refill Oak, Citrus (Mandarin, Orange) and Pepper. Fish/Shellfish on the BBQ, Cured Meat, Vanilla, Band-Aid, Nuts, Honey, Ginger, Tar, Ashes, Licorice and Menthol. Young, Sugary Sweet and Dusty. Again, Peat and Smoke are the main drivers. Muddy Peat, Cold Smoke, Ashes, Tar, Herbal Tea, Licorice, Pepper, Nutmeg, Nut-Shells, Toasted Barley, Mandarin and Salted Toffee. Middle-Long and Sweet with a few Bitter notes towards the Medium-Dry end. A little Thinner than you would expect at 50%. I find Muddy Earth, Cold Smoke, Ashes, Tar, Straw, Toasted Barley, Lemon, Mandarin, Grapefruit, Charred Refill Oak, Nuts, Pepper, Ginger, Nutmeg, Cocoa Powder and a hint of Raspberry. I added a few drops of Water and the Malt develops on the Nose. But the New Make Spirit or Vodka feel becomes stronger. Palate and Finish become very Thin. Better sit it neat. Okay. Uneventful and actually Boring. The Cruach Mhona (Gaelic for Peat Stack) is a lightly peated Bunnahabhain that was launched in 2011, initially only for the Travel Retail shops. Just as the Ceobanach, the Cruach-Mhona totally disappoints me. Another Young, slightly Peaty whisky without depth and character. Apart from a little Citrus it is totally lacking Fruity components. It's quite interesting but not very pleasing that both Bunnahabhains make a Thin impression despite the high ABV. Indifferent Cask Management if you ask me. If you like this distillery you're way better off with the standard 12 years that has a much better Price/Quality ratio. Maturation: Marriage of Bourbon Casks and Red Wine Casks from France & Italy. Price Range: US$ 80-90 (April 2018). Buying Advice: 😒 Not good enough at this price level. Look for alternatives! Light, Young and Sweet with a few Sour and Salty notes. The Alcohol is not fully integrated. Sweet Barley, Buttered Toast, Butterscotch, Vanilla, Salted Caramel, Brown Sugar, Yeast, Red Wine, Almond Marzipan and Nuts. Honey, Dried Fruit (Raisin), Berries, Brine, Hazelnut paste, Cinnamon, Nutmeg, and Ginger. A Touch of Sulphur right at the start. Thin, Young, slightly Sharp and quite Dry. Sweet Barley, Brown Sugar, Salted Caramel, Charred Refill Oak, Dried Fruit (Orange and Apricot), Artificially Flavoured Candies (Raspberry, Strawberry, Cherry), Pepper and slightly Sour Red Wine. Dusty Road, Brine, Cocoa Powder, Hazelnuts, Ginger and Cloves. Middle-Long, Bitter-Sweet and a little Hot. Quite Dry towards the end. I find Sweet Barley, Salted Toffee, Cocoa Powder, Mulled Wine, Artificially Flavoured Candies (Raspberry,Strawberry), Charred Oak, Hazelnuts, Citrus, Pepper, Cloves and Ginger. I added a little Water and the Nose becomes even more Yeasty. Palate/Finish do not really improve although the sharpness disappears. It becomes Thin though. Okay I guess. This Whisky leaves me completely indifferent. The Eirigh Na Greine (Gaelic for "Morning Sky") was released in 2013, originally only for Travel Retail. The name refers to the Amber colour of this Whisky that was partly matured in Italian and French Red Wine casks. As you know I'm not a huge fan of Red Wine Finishing in general. And this Bunnahabhain won't change my opinion on the subject. The combination of Young Malt, indifferent casks, a high ABV and a relatively short Finish almost never works for me. The result in this case is a Thin, slightly Hot and under matured Single Malt with a few Mulled Red Wine notes. Not at all my style. If you like this type of Whisky however look elsewhere. I can fully recommend the Longrow 11 Years Cabernet Sauvignon. All in all this was a very disappointing Bunnahabhain session. The way I see it, all three expressions suffer from Youth and indifferent Cask Management. Many people are of the opinion that distilleries do not use their best casks for Travel Retail expressions. I certainly believe this is the case here. 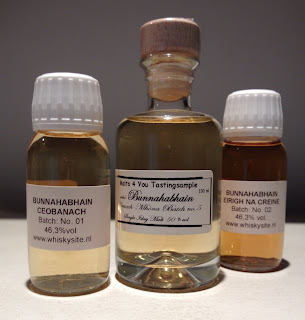 If you like Young Bunnahabhain, go for the 12 Years or the Toiteach instead. Cheers! The pictures were taken during our visits to this distillery in May 2014 and May 2017.